Do you like this above gif and want to know how I have created Its not rocket science and believe me you will not have to used any photoshop or any paid software to make this gif.This is preety simple.I will show you this in a simple steps that you have to follow. Step-1 : There are many awesome sites on google that will offer you free services. Out of these sites I have used this one and seriously I'm in loved with it. Step-2 : This site looks like this shown below. Simply click on the "3D cube" from the right hand side menubar. Step-3 : Now you will see the screen like this which is shown below. There are five arrows in the picture where you have to insert different images of your choice .After uploading five pictures , you can control the rotational speed ,Here you will get the four options i.e, Ultra rapide, rapide , moyenne and lente. According to your choice ,you can select anyone. You can also change the background colour of your choice, direction of the rotation i.e, Clockwise and Anticlockwise . Step-4 : After finishing all these steps , click on the "Create my 3D cube" button which is green in colour shown in the above picture. 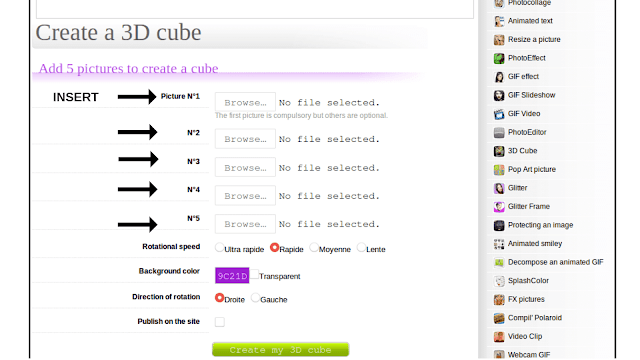 Step-5 : You will get the screen like this after clicking the "Create my 3D cube" button. Now simply click on the checkbox given before Download without logo and then click on the "Download my GIF" button and save it on your laptop or Pc. That's it ,you have successfully created the 3D images cube. I have used its other options also.you can see below ,some of my gif images which i have created using this awesome website . You can used it to. 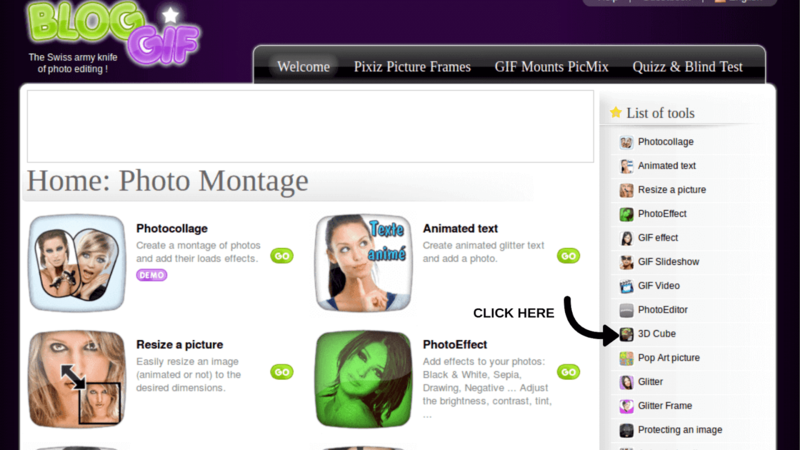 Now you can go and jump into the website and show your artistry. Show me too what amazing gif you have made...just comment below.. I think I am just afraid I will do something to my computer--irreparable damage-if I try anything like this--I still can not even make a button without shivering! don't be afraid...try new things everyday...gud luck.. This post I have created for you.so that you can make buttons easily.."How to create button for your blog easily without any technical skills "
You make it look so easy! Thanks for explaining this in simple terms that even someone like me can understand. With the videos I've been making lately this could really make them pop more. Plus, photoshop is something I've been planning on getting but haven't gotten yet, so this is going to be cool. Thanks. I ahve always though it is hard! thanks for super easy and easy to follow tutorial! Nicely done! We never know till we know. Didn't know it was foing to be this cool and quite fun to make them. New knowledge gained from your blog today. This is so cool. I had no idea that it could be this easy! Thanks for sharing! This is so cool! I wonder if the boys would like to try making something like this. Should be fun. This sounds like a great tool. Perfect since I actually planning to have an online training using Photoshop. That is so well done and so uselful! I’ve always wanted to do that, but never knew how. Thanks for sharing. That's pretty cool! I'll give it a try sometime. I'm a fan of gif and I love making them.